Replacing a new roof in Atlanta is something most homeowners do only a few times in their lives. Do it right, and you will add decades of beauty, comfort and energy efficiency to your home. If done wrong, you may end up multiplying your initial investment in repeated repair costs. Choosing Weldon Home Exteriors may be the most important thing you do. Replacing a new roof is something most homeowners do only a few times in their lives. Do it right, and you will add decades of beauty, comfort and energy efficiency to your home. If done wrong, you may end up multiplying your initial investment in repeated repair costs. Choosing Weldon Home Exteriors may be the most important thing you do. Weldon Home Exteriors uses high-quality roofing systems perfected by Owens Corning. This is going to be a beautiful decision. 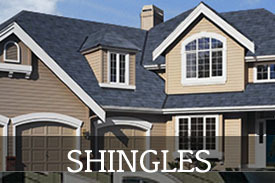 Shopping for new shingles is the perfect opportunity to increase the curb appeal of your entire home. Your roof can make up more than half of your home’s exterior so it should complement your home’s style and exterior color scheme. Have you seen the granules? Owens Corning shingles get their rich color from a combination of colored granules. Using the colors of these granules, you can coordinate all of your home’s exterior elements - the paint, siding, brick or stone.